If you’ve lusted after Jeeps but found the Wrangler and Grand Cherokee to be way out of reach, the Compass could be the SUV that helps you live your dream of owning one. It is probably the most important model for Jeep at the moment, and that’s not just for India. 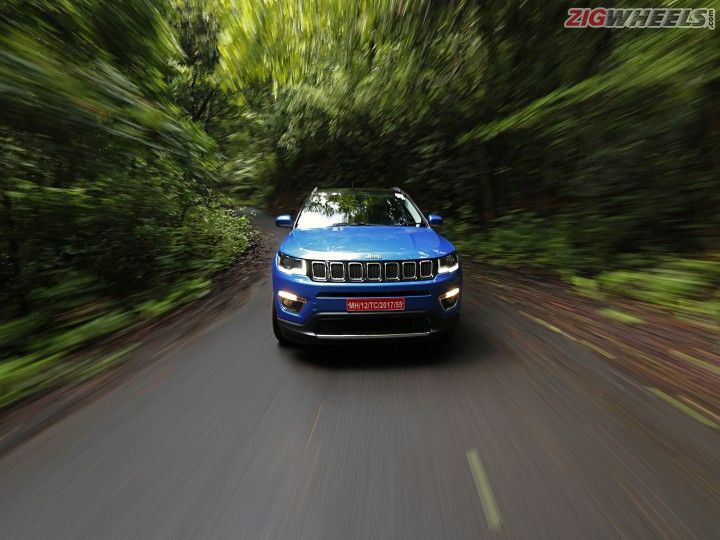 After all, the Compass is the SUV that will put Jeep within the reach of most buyers wanting to own a piece of the brand’s enviable heritage. Admit it or not, Jeep is pretty much THE word when it comes to SUVs. It is what Harley-Davidson is to cruiser motorcycles and Mustang is to muscle cars — an icon. To the point that people in our country think of Jeep as a segment of cars and not just a brand even today! Clearly, there’s a lot riding on the shoulders of the Compass then, particularly for our market, given the Indian car buyer’s penchant for SUVs. A quick experience in Goa – on and off-road both – was the perfect way to see how it feels from behind the wheel. The Compass will be the most affordable Jeep in our country and is positioned as a premium compact SUV. With a design similar to the far more expensive Grand Cherokee’s, the Compass looks striking. The trademark seven-slat grille and rectangular headlamps make for a stunning face, and it looks properly upmarket and modern. The Compass is easily the best looking SUV in its segment, and the scores of people checking it out on the road only confirmed that. The squared wheel arches are a nod to the typical Jeep design, and while the tail lights do remind of the Grand Cherokee’s, Jeep tells us their design is inspired by the Ironman. The Jeep name sitting on the hood and 'Compass' on the lower half of the front door instead of the rear of the SUV are small but unique touches, as is chrome lining across all window sills. The Compass isn’t too tall at 1640mm, and that makes for a hunkered down stance with the flared wheel arches and muscular lines. The interiors again reminds one of the Grand Cherokee and the upmarket feel continues inside as well. The top of the dash uses soft-touch plastics which adds to the premium feel. That said, the 7-inch touchscreen could have done without the piano black surround and could have been an inch bigger. The steering wheel feels nice to hold while the instrument pods behind it wear a simple yet appealing look. The multifunction display offers a crisp resolution and a whole lot of information. One of the highlights inside is the gear lever top which is a ball of metal with a satin finish. Thanks to drafts of cold air from the blowers it stays cool and feels nice to hold. Storage space is limited with just a small cavity behind the gear lever, followed by two cup holders behind, and a glovebox under the sliding armrest. Our test Compass came with a two-tone finish – the top of the dashboard was finished in black while its lower half and the seats were finished in white. The seats are part leather and the white hue looks good with the contrasting red stitching, but I’m afraid the seats will get covered in grime too soon and start looking dull. Of course, black hued seats are on offer as well. The quality of some of the matte black plastics like the ones on the door panels could have been better but everything inside does have a solid, built to last feel. Yes. There’s good amount of space at the front and there’s ample legroom and kneeroom for the second row as well. I’m just an inch less than six feet in height and headroom was adequate though taller people will feel otherwise. The rear seatback is set at a comfortable angle and there’s ample under thigh support thanks to the added width of the seat squab. Seating a third person at the back could be a bit of an issue though due to the contour of the seat squab and the transmission tunnel. The feature list is impressive on the Limited version we drove, which is the top-end diesel variant. Six speakers offer a crisp audio quality and the infotainment system comes equipped with both Apple CarPlay and Android Auto. The Limited variant also gets a reverse camera with guiding lines and the resolution of the camera is good. Headlights are bi-xenon HID units and offer good illumination in the dark. There are a few misses though. For instance, the inside rear view mirror doesn’t get auto-dimming, and even the driver’s seat has to be adjusted manually. There’s an electric park brake, though we would have liked a manual one instead. On the other hand, the tail gate has to be operated manually though that's something we would have liked with an automative system. Also, there is no option of a sunroof, which is a glaring omission. The left side of the steering wheel houses switches for the multifunction display between the clocks, but the right side only has a set of blank switches, possibly for cruise control, which isn’t being offered currently. Audio controls sit under the steering wheel quirkily and could have been integrated on the top as well. There is a separate USB port for rear seat occupants, which is a thoughtful addition. Okay, can it go off-roading like a Jeep? Yes! The off-road section was the highlight of our drive, and the Compass did impress us. The off-road course was a 3.5km-long track with lots of slush thanks to the downpour shortly before we headed out, which made it tricky. There were a couple of river crossings, steep inclines and a few super tight turns to be made in the muck as well. And the Compass took it all in the way you would expect a Jeep to. I barely lost sensation of the direction the front wheels were pointing in even in the trickiest of sections thanks to the feedback from the steering. Switching to mud mode on the SelecTerrain ensured there was enough traction to make forward progress even on the inclines, and even if I had to come to a full stop on an incline, hill hold ensured the Compass didn’t roll backwards. Due credit also goes to the Firestone all season tyres that offered good grip even in the muck. All of the above points to the fact that the Compass can probably handle better than some of the more expensive SUVs on sale in the country when it comes to going off the tarmac. The SUV is a great example of Jeep’s expertise in making some of the most capable SUVs on the planet, and the manufacturer, in fact, claims the Compass is the most capable compact SUV ever! Almost all of the terrain was done in first gear, and there was enough bottom end grunt from the motor to propel the SUV forward – we don’t know the kerb weight of the India-specific Compass yet, but it certainly is no featherweight. Is it equally good on tarmac? Given its abilities off tarmac, I was surprised how well the Compass drives on road. It gets Frequency Sensitive Damping suspension, typically found on more expensive cars. The system adjusts damping according to road conditions and your driving style to offer an optimum balance between ride and handling. We were thoroughly impressed with the ride quality on bad roads strewn with stones and gravel and various undulations. The SUV simply took it all in its stride and moved forward without unsettling the occupants. This behaviour in conjunction with the perfectly weighted feel from the steering wheel and the feedback it offered convinced us that the Compass is an excellent handler even on the road. Even at higher speeds the Compass stayed planted, offering a very confident feel. Jeep says a lot of effort has gone into ensuring the cabin is quiet, and the engine noise aside, the Compass feels very quiet inside. Credit that to the sound deadening in the floor pan and the triple sealing on the doors and glass used for the windshields and windows. In fact, the Compass, on the whole, felt solidly built and planted, almost like a battle tank, making for a very reassuring feel of being a well-built automobile.